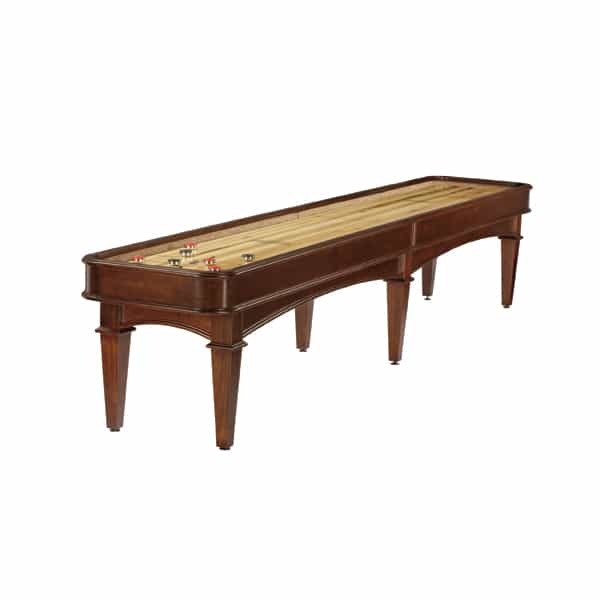 Designed for both amateurs and competitive players, the Gunnison Shuffleboard Table from Brunswick Billiards combines an antique furniture look with professional-quality game play. Guests will love the Chestnut-finished Maple wood of the cabinet, tapered legs and other classic design elements that create the traditional appearance, while elite competitors will love the 1/4" thick polymer resin game surface. There's something for everyone with this shuffleboard table! So bring home a fun game everyone will enjoy with the 16' Gunnison Shuffleboard Table from Brunswick Billiards and Family Leisure! Brunswick items are available in stores only and cannot be sold online. Please note that not all Family Leisure Stores carry Brunswick, so we urge you to call or email for local availability. Family Leisure carries a wide variety of options from the top named brands in the industry and we welcome the opportunity to discuss which option might be the best one for you. Our knowledgeable sales professionals and fully staffed service department are available 7 days a week to answer any questions that you may have. We look forward to hearing from you and we invite you to visit one of our beautiful showrooms.